Haruhiko joins Kurumi in her internal conflict over joining the Phantom Hunting Club on a formal basis. Episode 6 - "Kurumi and the Teddy Bear Kingdom"
Kurumi did get her own episode to shine and it directly addressed her reluctance to join the amazing big sister types (and Haruhiko...). It used both the idea of a security blanket and the imagery of stepping forward for Kurumi to gain some confidence and officially join the harem. She thinks she's joining Big Sister Mai's harem but we know Haruhiko's harem was missing the loli character, so it's Mission Complete for him. The other girls didn't have much to do except wait and wonder about Kurumi's reluctance too. I notice they didn't even care about Haruhiko's whereabouts. I found it adorable that their infant forms were all just sitting together doing their own thing. Eating her blankie is something Reina would totally do. Mai doesn't like to share her close friends, which matches the little bit of jealousy we've seen already regarding Haruhiko. I'm not sure what to make of Koito trying to take the other babies' things, other than she doesn't have her own security item yet. Ruru, being the only mature (kinda-sorta) girl sucked into Kurumi's internal conflict, had to shoulder the fanservice and the comedy. She went with the flow and was scared of falling into Kurumi's abyss, but Haruhiko reminded her that she can fly. Ha! Almost every episode Ruru confirms that Haruhiko is a breast man and the Mai route is the good end. Don't touch weird looking mushrooms, Ruru-chwan! I appreciated that Haruhiko was rendered useless by not having his art supplies with him so he couldn't do anything at all to help Kurumi in resolving her tragic fairy tale. That was good for Kurumi, but it totally doubled down on the joke of the useless main character harem king in this show. 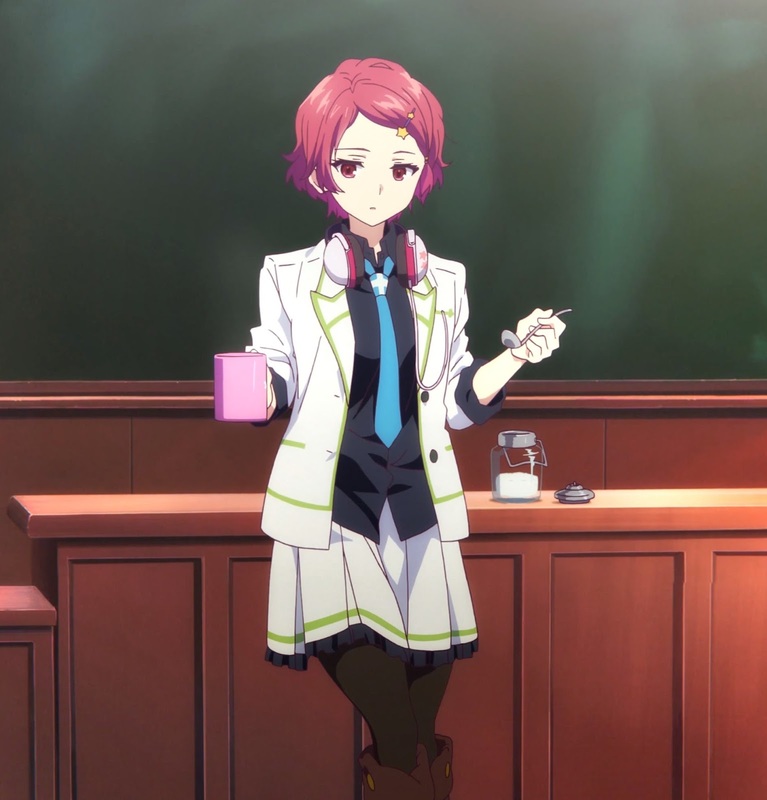 I noticed that Haruhiko didn't want to eat the honey in this world, but Kurumi didn't have any ill effects of being trapped in a phantom world. That was consistent since it was a mental block in her own mind given phantom form with Albrecht the Teddy Bear as her Knight-Errant. It was not like an external phantom spiriting away susceptible youths. It's not surprising that bears were on Kurumi's mind with all the homophone puns going on with her name, her school, her prefecture and so on. I was initially puzzled why a sand rake would be such a prized possession for Kurumi, but then I realized that in her flashback where she first made friends, she hugged Albrecht tightly to give her courage and stepped forward to talk to some little girls playing in a sandbox. It was her first totem of power in overcoming her shyness. In fact, if you look at the transformed rake that became her magical girl wand, you'll see other toys making up business end. I'm sure each of those items has a special memory tied to Kurumi showing courage. Also, it was consistent that breaking a children's game rule of only stepping on the white paint of a crosswalk sparked the gate into her internal conflict, especially when Haruhiko's presence compounded that rule-breaking. I wonder what object she'll tie to this memory of breaking out of her fear of fighting phantoms and making new friends. Haruhiko's harem is now complete and it took half a season to get there. Will the mystery of the neural virus and dealing with its aftermath really take 6 episodes to resolve? We still need our beach, swimsuit, hot springs training camp episode(s), so maybe the main story will only take three episodes or so. I'm expecting some hard feels in the latter half of the season and I can see a path where some of the characters will have to say goodbye to phantom friends. Will it go that way? I don't know, but I'm hoping the show doesn't run out of steam and tackle the mystery half-heartedly. Bittersweet happy memories ending or fun hopeful ending after some drama? Either way would be a good resolution to this interesting premise.